Industries: chemical, food, mining, paper, textile. Agriculture products: dairy products, fruits and vegetables, seafood, livestock, wool. 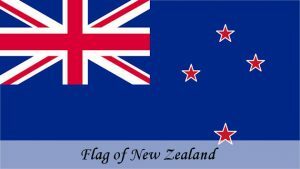 Country of New Zealand is comprising two large islands – the North Island and the South Island and many smaller islands. In Maori language, New Zealand is Aotearoa. On the South Island of New Zealand is the highest peak in the country Aoraki/Mount Cook; 3,754 metres (12,320 feet) high.